Blek le Rat was born in Boulogne-Billancourt, Paris in 1952 as Xavier Prou. The children's cartoon "Blek le Roc", using "rat" as an anagram for "art" is the reason behind his name. He was first influenced by the early graffiti in New York, but upon visiting realized Paris would be better suited with a more realistic style. He remodeled the streets of Paris creating a name for himself as the 'Godfather' of stencil graffiti art. However he did have to face the Parisian court on the account of causing 'damage to other people's property.' He began to put up posters, stickers, and cutouts of his stencils to spread his art in a more accelerated fashion and to avoid authorities. 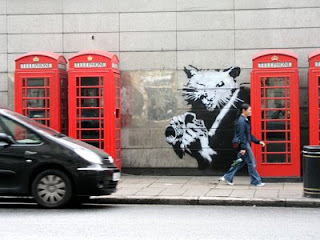 He began his style of graffiti by spraying rats in the streets of Paris. He chose them because he says "they are the only wild living animals in cities and only rats will survive when the human race will have disappeared and died out". They seem to represent the portion of society that has pushed out of sight and mind. 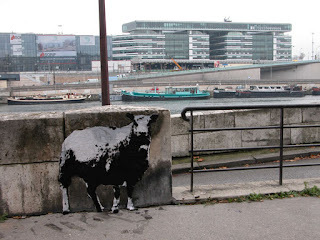 "The Sheep", first drawn in 2003, represents the realism involved in Blek le Rat's work. 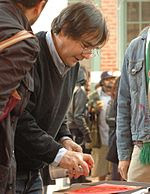 He would re draw the sketch in new locations around the city in order to spread his work and name. In the 1980s, Blek was inspired by English artist David Hockney who created life sized crayon drawings. Blek began trying larger stencils and is now often credited as the inventor of full-scale human character stencils. "Ballerina" appears at 941 Geary Gallery, San Francisco. Blek mainly worked in black and white and he chose his locations carefully. This was done in order to "reproduce the ambiance of the street", according to Blek. 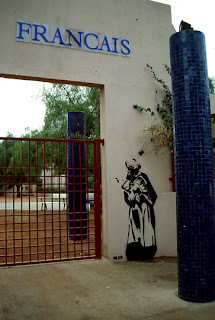 This stencil graffiti in Marrakech, Morocco is and example of his attempt at capturing the moment in a place. What about Blek le Rat's work is particularly "French"? Blek was inspired by the graffiti he saw in New York in the 1970's yet wanted to create a style that suited Paris. He chose the stencil in mainly black and white which he felt represented the french culture. Stencils were used in the Renaissance. How has his graffiti influenced a particular cultural movement? He had a great influence on graffiti art including the "guerrilla art" movements. The main motivation behind his work was social consciousness and his desire to bring art to the people. The Guerrilla art movement became famous in the 1980's when people began expressing views and sharing ideas through art form in public places. What are some major themes that are addressed? Blek's motivation for his work was to bring issues of social and political consciousness to the forefront. Some of the major themes seen in his work are those of freedom, self-expression, frustration with capitalist society and political processes. Gilewicz, Samantha. 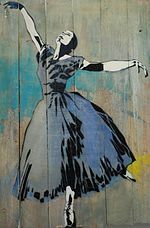 the insider: blek le rat. Nylon. April 4, 2008. Retrieved 2011-3-29. Coan, Lee (13 June 2008). 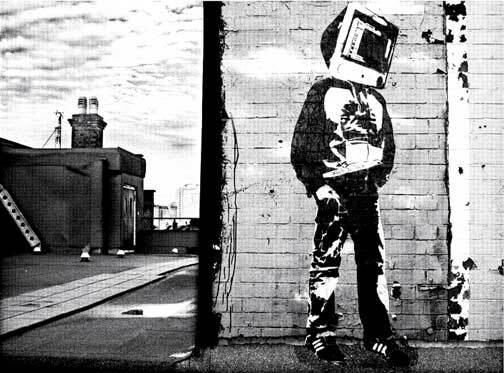 "Breaking the Banksy: The first interview with the world's most elusive artists". Daily Mail (London). Blek Le Rat interview. UK Street Art. July 29, 2008. Retrieved 2011-3-29.